The first genome sequencing cost $2.7 billion and took 15 years. There are an estimated 25,000 genes in the human genome, comprised of approximately 3 billion nucleotide base pairs. It took the Human Genome Project (HGP) approximately 15 years and $2.7 billion to sequence the entire human genome (minus about 1 percent) using the DNA of several volunteers. 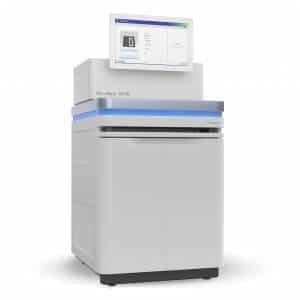 Now, San Diego-based sequencing company Illumina has debuted a new sequencing machine, the NovaSeq (NovaSeq 5000 and NovaSeq 6000), that it says will one day be able to sequence an entire genome for less than $100 in fewer than 60 minutes. This is a steep difference in both cost and time compared to that first sequenced genome, but it follows the trend. In 2006, Illumina released their first machine, which could sequence a genome for $300,000, but by last year, that price had dropped to $1,000. “This is good news, affirming that the field is still so healthy that price-plummeting is still considered good for business,” says George Church, the Robert Winthrop Professor of Genetics at Harvard Medical School. While the NovaSeq is not yet capable of such inexpensive sequencing, Illumina’s promising projections are exciting, to say the least. This massive advancement in sequencing technology would have implications both in research and for the average citizen. The drastic reduction in cost would allow for faster progress in clinical research, pushing research for cancer and other genetically linked diseases forward. But even outside of the obvious advantages this would provide to different types of research, it could also create incredible possibilities for individuals. Companies like 23andMe and AncestryDNA that utilize sequencing machines (often from Illumina) cater to people looking to learn a bit more about their own unique genomes. And while the sequences (and brief but questionable analyses) given to consumers are interesting, they don’t serve a serious practical purpose. Quick, affordable genomic sequencing could revolutionize the way that human health is evaluated. Since people are made up of such unique characteristics, moving healthcare toward a more individualized approach could both increase our knowledge of known illnesses and allow for more tailored treatment options. If every patient receiving medical treatment had access to their entire genomic sequence, their doctors could have added insight. Though the NovaSeq machines are not yet capable of sequencing an entire genome for less than $100 and the raw data that can be generated in under an hour takes much longer to interpret, as the new technology is adopted, the price is predicted to drop and the time necessary for helpful data analysis will decrease as well. While the machine is currently only owned by six customers, including the Chan Zuckerberg BioHub, the Broad Institute of MIT and Harvard, Regeneron, and Human Longevity Inc, this initial test period will hopefully prove that there is a bright future for these next-generation sequencing devices.